The OptoSigma 111-1125 Adjustable Lens Holder is 86mm wide and will accept spherical lenses from 10mm to 60mm in diameter. This adjustable bar style of lens holder is a common design and OptoSigma improves it by adding the thumbscrew adjustable clamp. 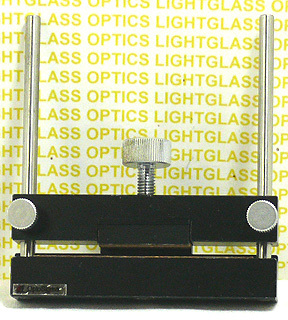 This clamp allows sensitive adjustment of the clamping force, as to not distort the lens element.